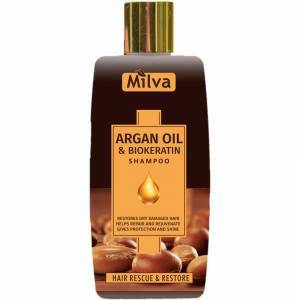 The argan oil in the shampoo nourishes every part of dry and damaged hair evenly, moisturises it and makes it soft, shiny and smooth. It ensures their protection and shine. The organic keratin strengthens the structure of the hair, helps its seal and restores the level of natural keratin, preventing hair breakage. It has a strong regenerating effect. Suitable for all hair types, especially dry, coarse and damaged hair. For the promotion of growth or reduction of excessive hair loss combine with the hair water quinine. The garlic extract helps against hair loss, hair thinning and hair breakage. It removes harmful toxins from the scalp and strengthens natural hair growth. It delivers volume to lifeless hair. 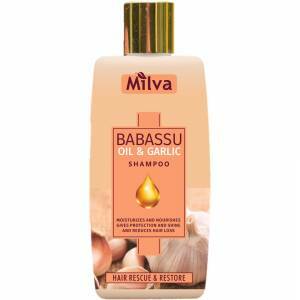 The Babassu oil has a similar composition as Sebum, it nourishes the hair, moisturizes it and restores its strength. It keeps the moisture in the hair long and makes it soft and elastic. 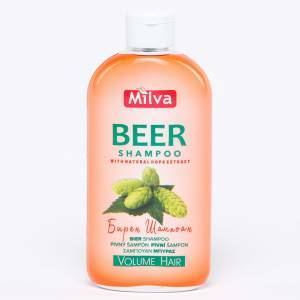 Milva’s Beer Shampoo has an excellent cleansing effect and protects the hair longer from becoming greasy. The synergistic action of hops and beer yeast adds gloss and volume to the hair and vitalizes and improves its overall condition. 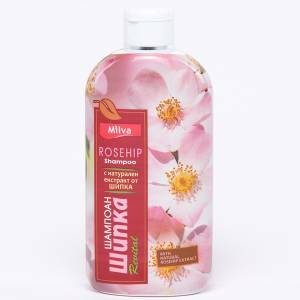 This shampoo nourishes the hair and skin with vitamins and amino acids. Thanks to them, the skin retains its freshness, the hair stops falling and becomes healthy, dense, and shiny. The effect of the Beer Shampoo becomes notably visible after approximately two to three weeks of regular use. Caffeine in the shampoo promotes and stimulates hair growth, prolongs the growth phase and prevents the effects of the hormone dihydrotestosterone (DHT), which is responsible for the hair loss. Firms the hair follicles and makes them healthy and vital. Does not dry out the hair – contains D-panthenol for hydration. Recommended for progressive hair loss, also for men. This product contains natural SLS, plant based. Total content of natural ingredients: 99.4%. 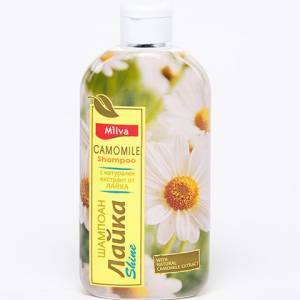 Milva’s shampoo with camomile extract is suitable for any type of hair. It cleanses and enhances the natural gloss of the hair. The glycerin, included in the shampoo formula, is the best natural moisturizer. The hair becomes light, flexible, well hydrated, and with a beautiful shine. 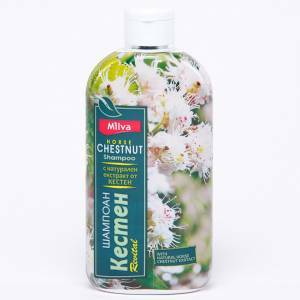 The Milva Chestnut Shampoo strengthens the capillaries and improves blood circulation in the scalp. This way it stimulates the oxygen flow to the hair roots. The chestnut strengthens the tissues in depth and slows down the skin aging process by suppressing the enzymes that break down elastane and hyaluronic acid. 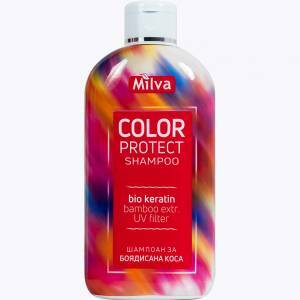 Milva Color Protect is a specialized shampoo for cleaning and professional maintenance of dyed hair. Through its regular use, the brightness and integrity of the coloring pigments are preserved for longer and the hair remains strong and naturally healthy. 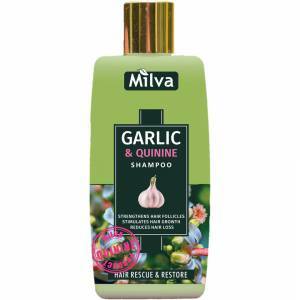 The unique combination of garlic and quinine extract promotes stable hair growth and stops hair loss. It strengthens the hair root permanently and improves the structure of the hair, increases its volume, makes it strong and beautiful. The garlic extract also removes harmful toxins from the scalp, improving their health and hair health. The ginseng contains a wide variety of bioactive components, the most important of which are the over 100 types of steroid saponins that make up about 20% of all healing substances in the herb. 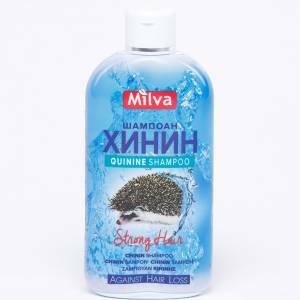 Milva’s Ginseng and Quinine Shampoo contains Korean Ginseng extract – Panax Ginseng, and has two main actions. Adaptogenic – the shampoo helps stopping hair loss due to stress. quickly into the scalp and are easily absorbed. 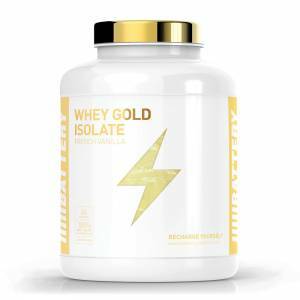 They tone the body, improve skin quality, and slow down the aging process of the skin and hair. 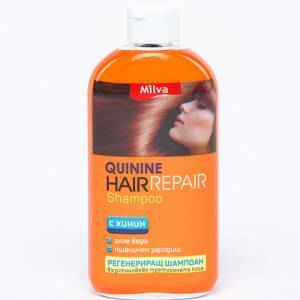 Milva Hair Repair is a specially formulated shampoo that revives exhausted, treated and damaged hair. 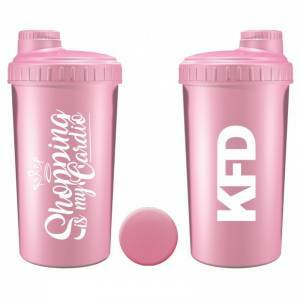 It has hair repairing and strengthening properties. 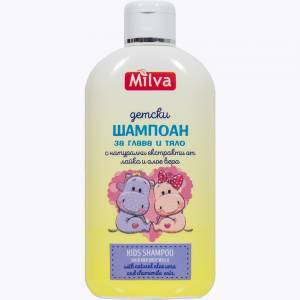 Milva’s Kids Shampoo is completely safe because it does not contain parabens, alcohols, PEG emulsifiers, allergic oils, etc. It is produced solely with plant-based detergents and the soft, non-irritating formula of this shampoo contains 99.16% raw materials of natural origin. The macadamia oil brings brittle and thinning hair back to life. It softens and nourishes the hair. It restores the natural moisture of the hair and protects against negative environmental effects. The quinine stops hair loss and accelerates hair growth. 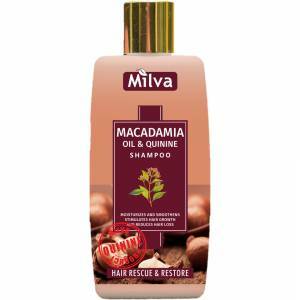 The combination of macadamia oil and quinine visibly improves the general condition of the hair. They become dense, elastic and healthy. The Milva Nettle Shampoo contains a large amount of natural wild nettle extract. It has excellent cleansing effect and acts softly and delicately without irritating the skin. Soothes the scalp, removes any inflammation and itching, and gradually stops the formation of dandruff. 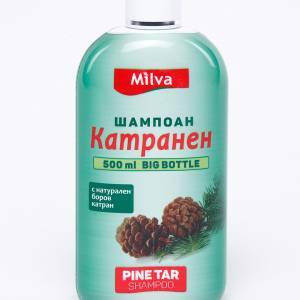 The pine tar is an extremely effective means of combating the most common hair and scalp problems – dandruff, hair loss, hair thinning, excessive lubrication, etc. It is particularly effective in combating dandruff, and only after a few washes the annoying fungus disappears without yo-yo effect. The pine tar regulates the action of sebaceous glands. 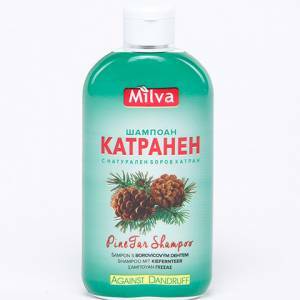 Milva’s Pine Tar shampoo is suitable for any type of hair and skin. 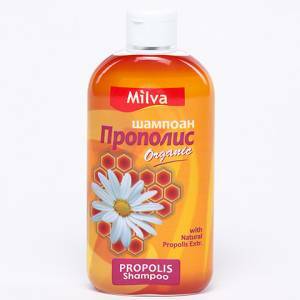 Milva Propolis Shampoo helps removing dandruff and its causes for its occurrence. It calms the irritated skin of the scalp and has anti-itching effect. It helps the quick restoration of damaged hair and prevents the formation of skin flakes. 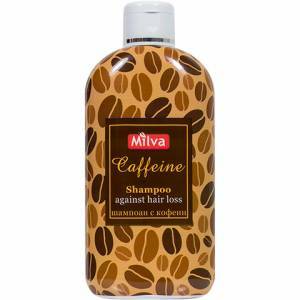 The regular use of Milva Propolis Shampoo strengthens the hair structure and protects against the adverse environmental effects. 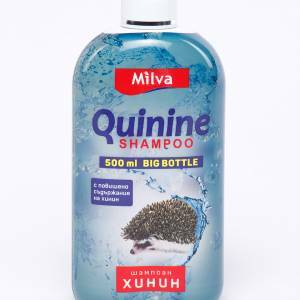 The quinine in Milva cosmetic products penetrates the scalp very quickly and increases greatly the blood flow. As a result of the increased blood circulation a large amount of valuable nutrients reaches the hair roots. The hair follicles quickly grow and heal. The overall condition of hair and skin improves, hair loss stops, hair grows faster and healthier. The development of dandruff and skin flakes ceases. 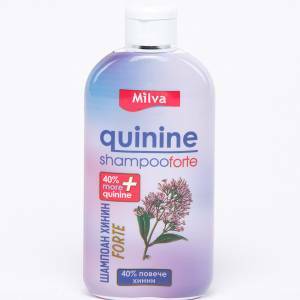 The quinine products from the Forte range of Milva contain 40% more quinine than the classic ones. 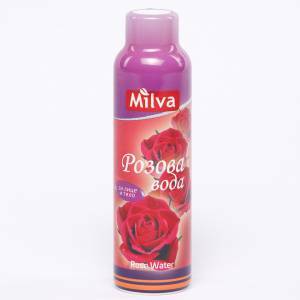 Thanks to the pure natural extraction used, Milva’s Rosehip shampoo is an excellent means of accelerating recovery and general strengthening of the skin (derma, epidermis, collagen and elastin) and for strengthening the blood vessels in the scalp. 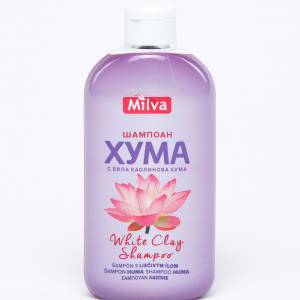 The regular use of Milva’s Rosehip shampoo gradually improves oxidation-reduction processes in cells. Enhances the regeneration of tissues and strengthens the hair roots.